The parades had ended, the bunting was removed, the guests had returned home. 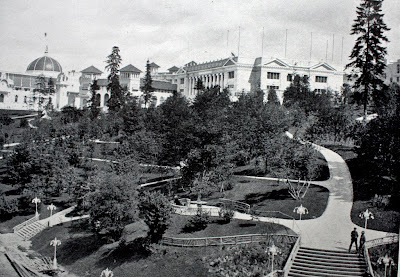 The white plaster city on the shore of Guild's Lake would be knocked down before it could rot. Portland's debut to a world audience, the Lewis and Clark Exposition of 1905 that celebrated a new era of trade on the Pacific rim, was over. 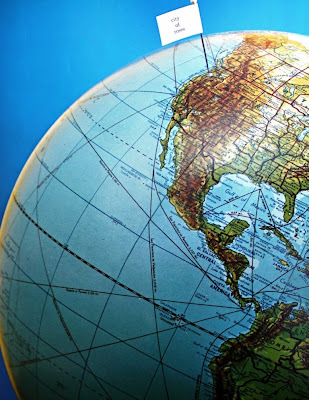 Portland was an early adopter to hosting a global event, as much transformative as promotional, along the lines of a worlds fair or international competition. Other western cities followed. Seattle took to the stage four years later with the Alaska Pacific Exposition and again with the World's Fair of 1962. San Francisco hosted the Panama-Pacific International Exposition in 1915 and the Golden Gate International Exposition of 1939. Vancouver BC, late to the show, caught up with Expo 86 and next years 2010 Olympics. 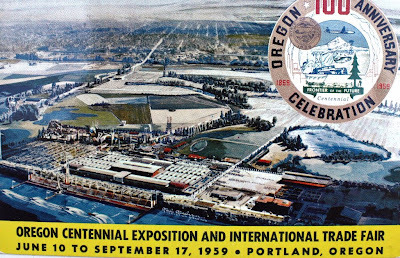 Portland hosted the Oregon Centennial Exposition and International Trade Fair in 1959, but despite its name, it was regional in scope and looked to the past as much as the future. As far as hosting a large scale international event was concerned, Portland was done in 1905. It was not for lack of trying. In 1962 Portland made a big play for the 1968 Olympic Games. The effort was lead by the Portland Olympic Council, which included Portland Mayor Terry D. Schrunk, Oregon Governor Mark Hatfield and a roll call of local and state-wide business leaders such as Glen Jackson of Pacific Power & Light, Gerald Frank of Meier & Frank, Ralph J. Voss of the First National Bank of Oregon and M.J. Frey, publisher of the Oregonian. At the apogee of the New Frontier, of the four hundred plus statewide business and civic leaders listed on the published membership roll, only fifteen were women. 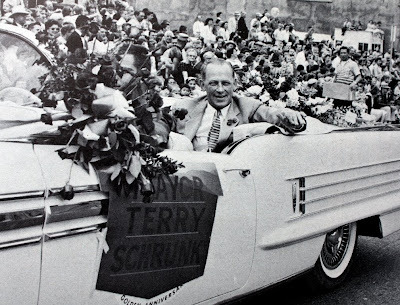 Portland Mayor Terry D. Schrunk. The decision to invite the XIX Olympiad built upon the existing ambitious initiatives during the Terry Schrunk administration that included a new zoo, the recently constructed Memorial Coliseum, a rapidly expanding freeway system, the dawn of Portland's urban renewal program and a proposed forty-eight million dollar stadium at Delta Park. 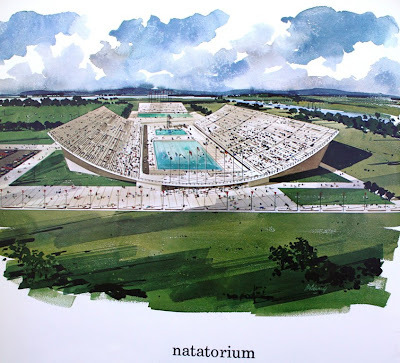 The stadium, as advocated by Portland Metropolitan Future Incorporated, would put Portland in contention for major athletic events and professional sports. "If Portland wants to be the great metropolis of the Northwest, serving the distributing, banking, cultural and entertainment needs of a vast four state area, it should act like one. And the best way to act like a metropolis, in a class with San Francisco and Los Angeles, is to provide a big league stadium for baseball, football and other outdoor spectaculars which will attract thousands of visitors on a year-round basis." -Fred Meyer in the Oregon Journal, January 9 1962. A new stadium was viewed as essential to attract major league sports, at the same time the city's minor league baseball team was experiencing difficulties in Multnomah Stadium (today, PGE Park). "I believe we are going through a cycle. I think baseball will regain popularity... Give us a new $900,000 park, seating maybe 9,000. We'd do all right, just as Tacoma has done and the hockey team is doing in its new facility." -Arch Kingsley, President of the Portland Beavers in the Oregon Journal, September 5 1962. To supporters of the Portland Olympic Council, the games would bring much more than sports to the city, jump starting plans already in the works. "The connection is obvious: the Olympic Games would leave Portland with a stadium, swimming pool and other facilities even more magnificent than those called for in the original proposal which Future Unlimited made last July. But beyond that, putting on the Olympic Games would move our area years ahead in its development of housing, highways and countless other things not directly connected with sports. Just as the Worlds Fair has done for Seattle, the Games would show the world that Portland is a fresh and vigorous Western city, with energy and brains in its people to match the beauty of its physical setting." -The Oregonian, Portland-Olympic City, September 5 1962. The Olympic bid was to be made to the site selection committee of the United States Olympic Committee, set to meet in Chicago on October 15 1962. The winning site would then be submitted to the International Olympic Committee set to meet in Nairobi Kenya the following year. 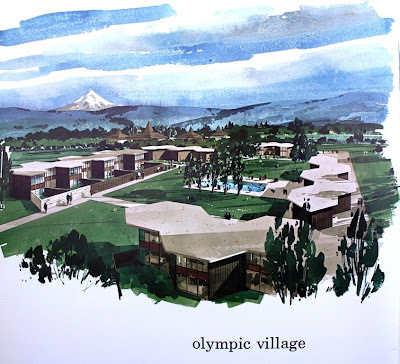 On September 20 1962, the Portland Olympic Council presented drawings of the proposed Olympic site created by the Oregon Chapter of the American Institute of Architects, to much public acclaim. "Portland, like a Cinderella gingerly slipping a foot into the glass slipper, tried on the 1968 Olympic Games for size Thursday and the picture was stunning." 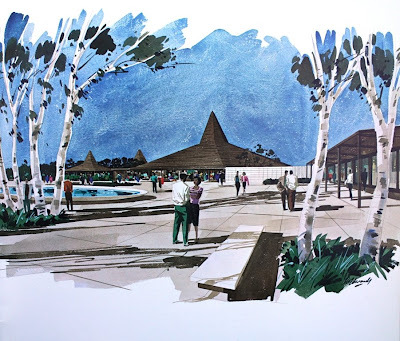 "It was a picture that left Portland almost beyond recognition, a Brasilia in the Willamette Valley with parking for 40,000 cars and a rowing race course on the Willamette and the men who would bring this all about were there to proclaim: "It can be done." 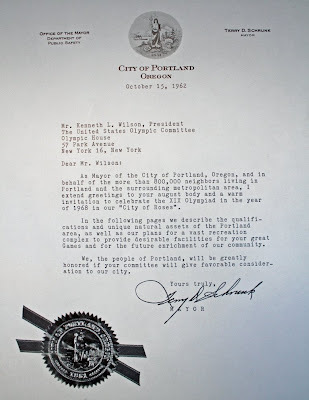 It opens with two letters: one from Governor Mark Hatfield to Mayor Terry Schrunk, and one from Mayor Terry Schrunk to the United States Olympic Committee, followed by a standard chamber of commerce style promotional piece on Portland's virtues, tweaked to project a certain diverse, internationalist je ne sais quoi. "Portland is Oregon's largest city with a population of approximately 372,000 and a metropolitan area of more than 800,000. As a major port reaching out to Alaska, Hawaii, South America and the Far East, the City is inevitably cosmopolitan in its makeup. Indeed, more than one person out of every five is either foreign born or fluent in his mother tongue. There are of course many Canadians who have settled in this area. A great portion of those of foreign extraction are from the Nordic countries of Europe and the United Kingdom, from Russia, China and Japan." "But most of us who live here are hardly aware of this cosmopolitan facet of our City's personality. We are far more conscious of her reputation as the City of Roses." 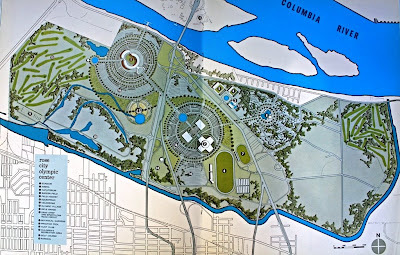 The proposed site covered Delta Park and the Oregon Centennial Exposition grounds. 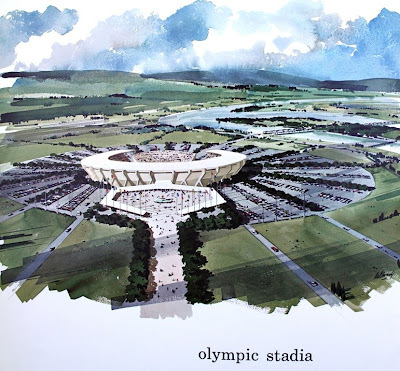 The Olympic Stadia was an outgrowth of the Portland Metropolitan Future Unlimited stadium proposal. It was to have seating for 60,000 with 20,000 more temporary seats and standing from for 10,000 for a total capacity of 90,000. The Natatorium features three Olympic swimming pools. 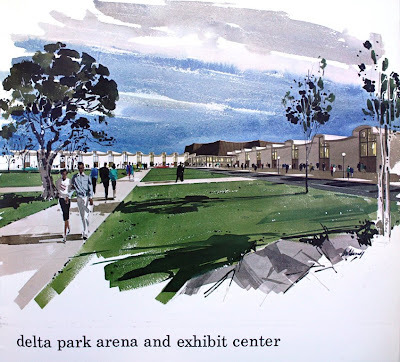 The Delta Park Arena and Exhibit Center: fifteen acres of covered exhibit and arena space, including room for administrative, reception and medical functions. 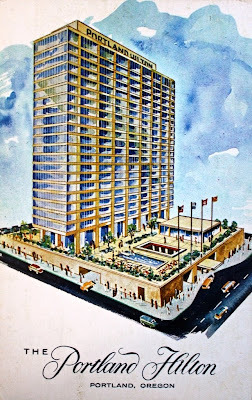 Postcard of the Hilton Hotel on Broadway, slated to be the headquarters hotel of the XIX Olympiad. 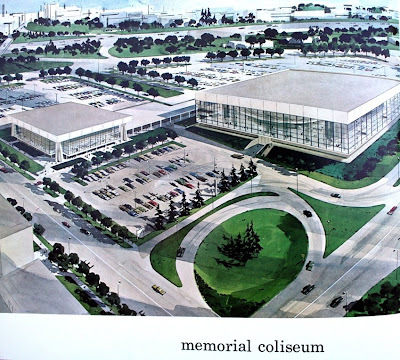 "Portland's $9 million Memorial Coliseum, opened in late 1960, is the newest and largest completely air conditioned arena-exposition building in the Northwest. 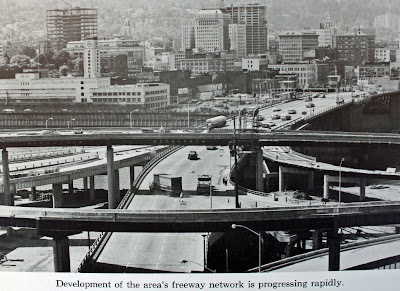 By 1968 it would be only five minutes driving time from the proposed Rose City Olympic Center. 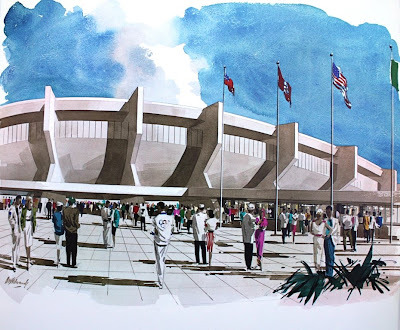 The existing arena, with seating of 14,000 and integrated exhibit space, is to be supplemented by a new 3,000 seat convention hall. This show place, located within walking distance of downtown Portland is supported by 3,000 parking spaces." 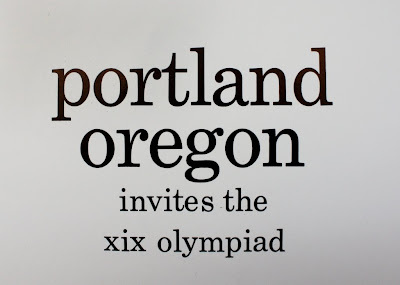 -Portland Invites the XIX Olympiad. 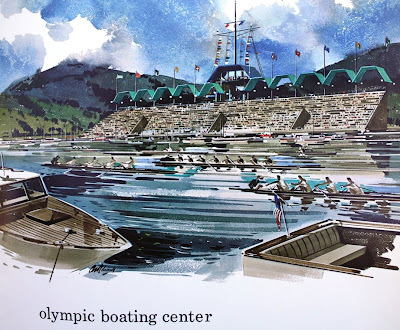 The Olympic Boating Center, to be located at Sellwood on the "placid waters of the Willamette." 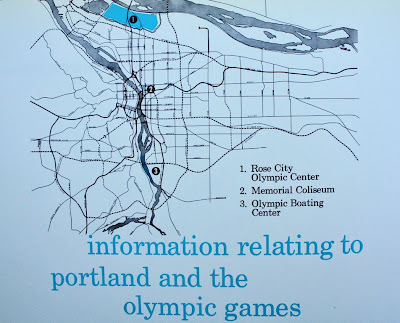 The Rose City Olympic Center linked by freeways to downtown, the Memorial Coliseum and the Olympic Boating Center. Planned additions to the freeway network (dotted lines) include the Sellwood, Mt Hood, Multnomah and Laurelhurst Freeways as well as a major tunnel under the West Hills linking downtown to the Beaverton-Hillsdale highway near Dosch Road. It was over as fast as it began. On October 16 1962 Detroit Michigan was selected as the American contender for the 1968 games. "Announcement of the Detroit nomination leaked out of the morning committee room only after Bob Kain, the selection committee chairman had broken away to inform Howard Hobson of the Portland delegation that our city didn't win. A trace of tears broke from the eyes of the ex-coach of the University of Oregon Tall Firs as he fumbled for a moment in asking...Why?" "The reason was obvious enough to those close to the strategy it takes to capture a U.S. Olympics nomination: Portland had not the time for the delicate, person to person political work needed to swing a national committee to this town in the West." "We were treated like gentlemen. They gave us a good hearing. Now we have to lay our plans for coming back for the 1972 games. We have laid the ground for '72. Let us not spoil the work that has been put into that." -Rudie Wilhelm Jr. president of the Portland Chamber of Commerce. "Now we have a job to do. We have got to go back to Portland and build a complex that will be there when we make our bid four years from now for the 1972 games." In Portland supporters resumed work on a stadium package that, if successful, would have the city in a better position the next time around. Three months later, there was a dramatic reversal of fortune. A bitter argument between Los Angeles and Detroit over the selection committee's decision forced a re-appraisal of the results. All of the cities that submitted proposals were invited back, this time to the full board of directors. With only a month for preparation, Portland's bid was reactivated. For the second effort, Portland was more focused on publicity and politics. 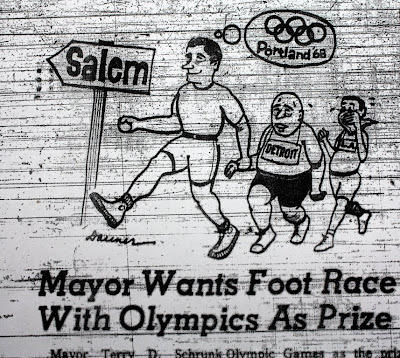 Mayor Schrunk issued a public challenge to the mayors of Detroit and Los Angeles to a fifty mile walking race from Portland to Salem, with the U.S. Olympic Bid as the prize. A robust Portland, represented by Mayor Schrunk, guides a winded Detroit and 98 pound weakling Los Angeles on a fifty mile hike in this March 1963 Oregonian cartoon. 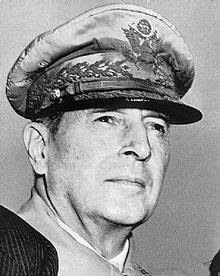 On the Political front, Governor Hatfield approached retired General Douglas MacArthur to advocate for Portland, to counter the star power of national figures Governor Pat Brown of California and Governor George Romney of Michigan (Jerry and Mitt's fathers). The general was initially favorable, but nothing came of Hatfield's efforts. Even with their energy and enthusiasm, few thought Portland stood much of a chance, a fact reflected by the Oregonian which called for a new stadium regardless of "the smallest outside chance of being selected for the 1968 Olympics at the reopened selection presentations in New York." That sentiment that was proven true. Detroit was once again selected. The final tally: Detroit, 32 votes, Los Angeles, 4 votes, Portland, 2 votes, San Francisco, 1 vote, Philadelphia, 1 vote. The following year, the 1968 Olympics were awarded to Mexico City when the International Olympic Committee met in Nairobi Kenya. Portland returned to the dream of a new stadium and the 1972 Olympics. In May 1964 the stadium, now covered and known as "the Delta Dome" went down to defeat in an election by 9,000 votes. A bid for the 1972 Olympics was mounted later in the year, but when a second stadium measure failed, Portland's Olympic dream was essentially over. With it vanished Portland's best chance to re-take the international stage. In my time running PNW at burnside, I arranged to sell a copy of this to the city archives. It was a red padded-leatherette hardcover, though, with a matching slipcase. It's too bad we didn't meet when I was there. I had been building an ephemera section with some material you probably would have loved to have seen, though it probably pales in comparison to things you've already got. Wow!- it sounds like you sold a presentation copy that belonged to someone well connected to the plan. My copy is much more simple. It doesn't even have a spine, but it was a quality job (rice paper end-papers) meant to impress. When I was running PNW at Beaverton, I did exactly the same thing and set up a place for ephemera. It was just getting lost (or worse, not being purchased in the first place because there was no place to put it). Not that I don't appreciate a good Binfords and Mort, but I love that stuff. Thank you for sharing! Glad to see this information.